Severe valvar pulmonary stenosis (PS) and moderate-sized muscular ventricular septal defect (VSD) with suprasystemic right ventricular (RV) pressures causing cyanosis can be corrected either surgically or by transcatheter interventions. , During balloon pulmonary valvotomy (BPV) and VSD device closure, we encountered a series of hemodynamic and procedural complications, which were successfully managed. Anticipation, prompt identification of these problems, and appropriate intervention can avoid morbidity and possible mortality. A 15-year-old girl weighing 32 kg presented to us with effort intolerance and significant central cyanosis. Her oxygen saturations were 78%. There was pulmonary oligemia and normal-sized heart on the chest X-ray. Electrocardiogram showed sinus rhythm, right axis deviation, and RV hypertrophy. Her echocardiogram showed a 11-mm anterior muscular VSD shunting right to left, with severe valvar pulmonic stenosis (PS). On cardiac catheterization, the RV systolic pressures were 40 mmHg more than aortic pressures. The pulmonary artery (PA) pressures were normal and the valvar gradient across the pulmonary valve was 120 mmHg. Right ventriculogram showed thickened and doming pulmonary valve; infundibulum showed dynamic systolic infundibular clamping, but opened well in diastole [Figure 1] and [Video 1]. Left ventriculogram revealed a moderate sized mid muscular VSD. After ensuring adequate intravascular volume status as shown by right atrial mean pressures of 12 mmHg, an initial BPV with 20-mm Tyshak II balloon (Numed Inc, Hopkinton, NY) resulted in excessive pulmonary flows, mild pulmonary hypertension, reduction of RV systolic pressures to 20 mmHg below the systemic pressures, and normalization of oxygen saturations to 100%. The subvalvar gradient was 60 mmHg and infundibulum opened well in diastole. 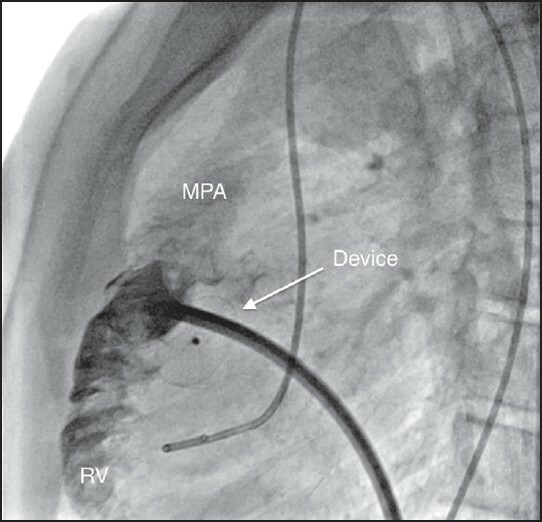 The VSD was closed with a 14-12 Amplatzer Duct Occluder (StJude Medical, St Paul, MN) from the right ventricle after establishing an arteriovenous circuit [Figure 2] and [Video 2]. After release, the RV pressure increased transiently due to dynamic infundibular hyper-contractility and the retention skirt of the device partially protruded into the left ventricle [Figure 3] and [Video 3]. The device was snared out from the left ventricle before embolization. 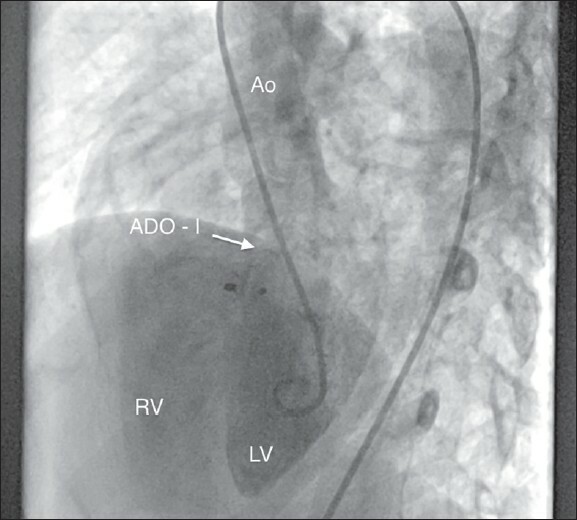 The device was replaced with an 18-mm muscular VSD occluder (HeartR, Lifetech Scientific, Shenzhen, PRC) [Figure 4] and [Video 4]. Even though device appeared tilted towards the left ventricle on left ventriculogram, right ventriculogram showed correct device orientation [Figure 5] and [Video 5]. On the following day, few ventricular ectopics were noted on routine examination and echocardiogram showed embolization of the device to the left ventricular outflow tract (LVOT). The large size of the device did not permit movement of the device beyond the aortic annulus. 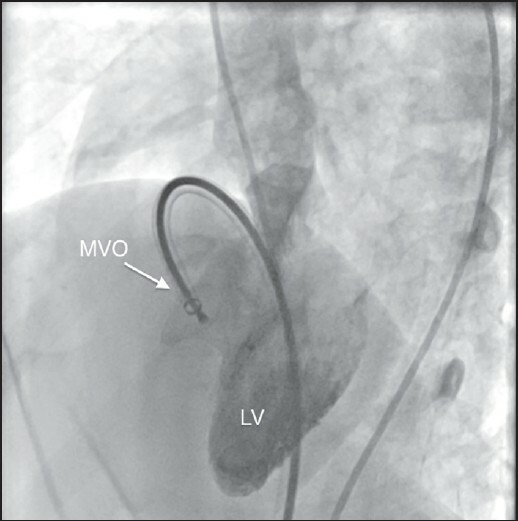 A snare catheter advanced into the LVOT to retrieve the device. 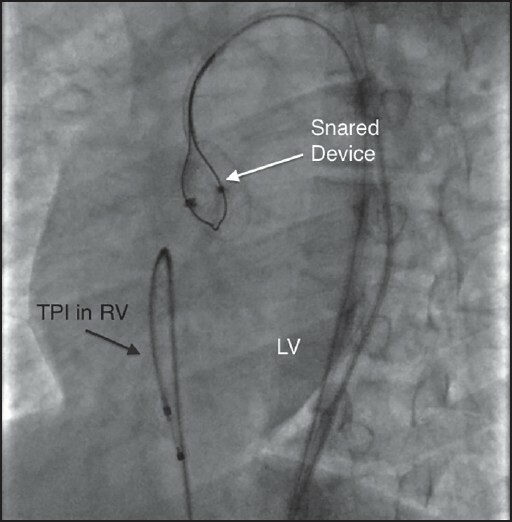 There was transient heart block needing temporary RV pacing [Figure 6] and [Video 6]. The device was subsequently snared into the abdominal aorta, but the screw end was facing superiorly. The profile of the device could be made smaller if the device could be slenderized by re-screwing the delivery cable to the device. It is important to slenderize the device to its smallest profile so that it could be removed through the smallest feasible arterial sheath. Through a 6 French left brachial artery access, a 6 French multipurpose guiding catheter was advanced into the abdominal aorta. This catheter allowed passage of a delivery cable of Amplatzer duct occluder I device. The large device was slenderized by re-screwing this cable [Figure 7] and [Video 7]. 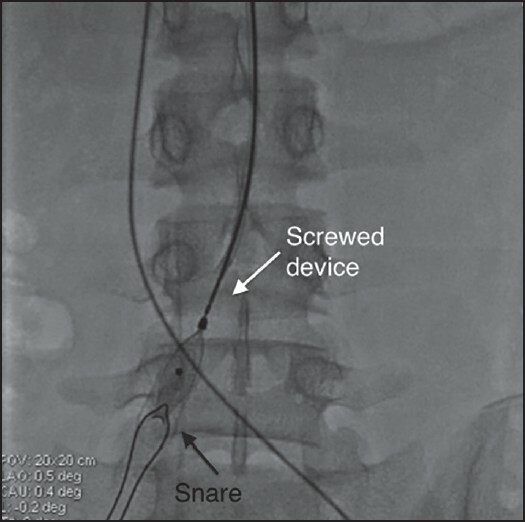 The non-screw end of the left ventricular retention skirt of the device was snared with a small 5-mm Amplatz GooseNeck Snare (ev3 Inc, Plymouth, MN) and the device successfully withdrawn through a 9F femoral arterial sheath. She developed progressive hypotension in the intensive care unit in the subsequent few hours, which warranted initiation of inotropic support with dopamine, dobutamine, and adrenaline. Intravenous fluids were not given despite hypotension due to the concern of excessive pulmonary blood flows through the VSD. The hypotension progressively worsened inspite of escalating inotropes; there was progressive severe hypoxia due to right to left shunt across the VSD despite ventilation with 100% oxygen, metabolic acidosis, and progressive anemia. While examining for causes of low hemoglobin levels of 6 g/dl, a large right iliac retroperitoneal hematoma was recognized. The dangerous combination of inotrope-induced hypercontractile RV infundibulum, severe intravascular volume depletion, and poor oxygen carrying capacity due to anemia triggered a severe "hypercyanotic spell". This was recognized on echocardiogram by under-filled hypercontractile ventricles and collapsed inferior vena cava. Blood transfusion, intensive hydration, infusions of phenylephrine, and complete withdrawal of other sympathomimetics aided immediate recovery within few minutes. The retroperitoneal contained bleed was managed conservatively. One month later, transjugular device closure of the VSD was done with a 20-mm muscular VSD device (HeartR, Lifetech Scientific, Shenzhen, PRC) after establishing arterio-venous circuit. During the previous attempts of device delivery through femoral access, the alignment of the device was never proper in relation to the plane of the ventricular septum. Inspite of a better alignment of the sheath with the septum through the jugular route compared with the previous femoral attempts, the device developed cobra deformity and slipped repeatedly into the RV. The VSD device was reintroduced and the tip of left ventricular disk was protruded out and the delivery sheath placed in the ascending aorta. The tip of the left ventricular retention skirt was caught with a 5-mm Gooseneck Snare (ev3 Inc, Plymouth, MN) passed from femoral arterial access. This maneuver allowed holding the RV end of the device with the screw to the cable and left ventricular end of the device with the snare. This stabilization of the device from both ends permitted successful deployment [Figure 8] and [Video 8]. At her last follow-up after 14 months, she is asymptomatic with no residual VSD and infundibular gradient of 20 mmHg. In patients with combination of VSD with right to left shunt and valvar PS, the cardiac output is dependent on the right to left shunt through the ventricular communication. In such patients, if a device closure of the VSD is done before BPV, the right ventricle will be exposed to even higher pressures and the systemic cardiac output might fall. It is prudent to relieve the PS before closing the VSD. However, if there is left to right shunt, the RV outflow gradient is not only caused by anatomic narrowing of the pulmonary valve but also due to the additional left to right shunt through the VSD. 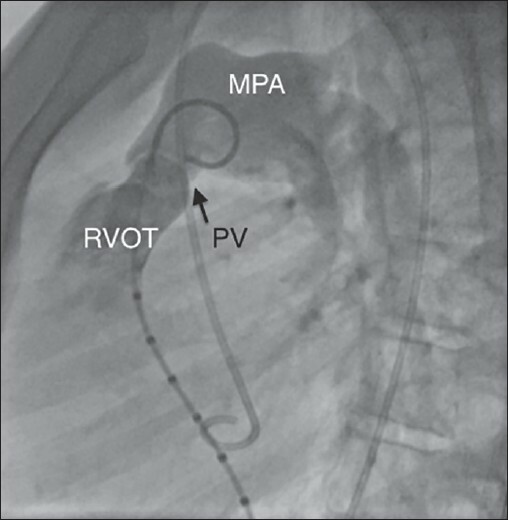 In such patients, device closure of the VSD might reduce the RV pressures and indicate the true severity of the PS. In these patients, it is better to close the VSD before the balloon dilatation of the pulmonary valve. In patients with combination of pulmonary valvar stenosis and mid muscular VSD, relief of PS by balloon dilatation may result in torrential pulmonary blood flows. This warrants quick closure of the VSD. The immediate elevation of PA pressures and improvement of oxygen saturations to 100% was indicative of large left to right shunt. So it was decided to close the VSD with a device in the cath lab. Complete relief of PS in presence of a fair-sized interventricular communication exposes the PA bed to sudden elevation of left ventricular systolic pressures. It would be prudent to go for a stepwise serial dilatation of the pulmonary valve with undersized balloons initially, if the plan is not to close the VSD in the same sitting. In our patient, we envisaged the need to close the defect in the same sitting and hence we decided to dilate the pulmonary valve with a balloon size equal to the annulus. In such patients, if the initial right ventriculogram shows isolated valvar PS with fully open infundibulum in systole, balloon dilatation of the pulmonary valve is preferably done after intubating the patient in anticipation of a sudden occurrence of hemorrhagic pulmonary edema. Resuscitative measures should be available to manage the ventilator parameters in the intervening period before closure of the VSD. In some patients, dynamic infundibular contractions may occur after BPV; especially if the intravascular volume is very low. We ensured that the intravascular volume was adequately maintained by monitoring the right atrial pressures around 12 mmHg. Episodes of elevated RV systolic pressures due to dynamic infundibular obstruction in this patient caused displacement of the first device and embolization of the second device into the LV. Selection of duct occluder device without a RV retention skirt on the first attempt and use of a relatively smaller muscular VSD occluder in the second attempt should have been avoided in this patient. Catheter manipulations in the LVOT for retrieval of the embolized device should be done with utmost caution to prevent abrading the conduction bundle below the non-coronary cusp of the aortic valve. The atrioventricular nodal block with bradycardia caused significant hypotension, which improved after transvenous RV pacing. In our patient, the atrioventricular nodal conduction normalized within a few minutes. Unexplained anemia in any patient after a prolonged catheterization should alert to a possibility of a retroperitoneal hematoma. Since this cause of hypotension was not recognized in the initial few hours after the cardiac catheterization, increasing doses of inotropes were administered and this triggered a severe hypercyanotic spell. , In patients with intact ventricular septum, a suicidal right ventricle with hypercontractile infundibulum will manifest with severe hypotension and this needs to be managed with fluid resuscitation to improve the ventricular filling pressures. In the presence of a moderate to large interventricular communication, severe hypoxia occurs due to right to left shunt and serious hypotension does not occur till terminal stages. Suicidal right ventricle should be recognized on an echocardiogram, which will demonstrate hypercontractile under-filled ventricular chambers with low volumes and color flow patterns across interventricular communication. A hypoxic patient fails to tolerate blood loss as poor oxygen transfer worsens metabolic acidosis. Once the hemodynamic pathophysiology was recognized, appropriate steps were initiated within 2-3 hour and this totally reversed the downward spiral of patient's course. The steps included aggressive fluid resuscitation (30 ml/kg bodyweight fluid administered in few minutes), packed red cell transfusion to improve hemoglobin concentration from 6 to 12 g/dl, rather abrupt withdrawal of dopamine and epinephrine infusions in the face of severe hypotension and initiation of phenylephrine boluses and infusion to counter the fall of blood pressures. Any post-interventional drop of hemoglobin levels should alert the clinician to look for a masquerading retroperitoneal hematoma. During the procedure in the catheterization laboratory, the right atrial pressures were maintained at 12 mmHg and this prevented the suicidal RV contractions and the patient remained stable during the procedure. However, after a few hours of retroperitoneal bleed causing intravascular volume depletion in the intensive care unit, there was a precipitous hypoxia. A continuous monitoring of the central venous pressures in the intensive care unit should have prompted initiation of volume resuscitation before very severe hypoxia. 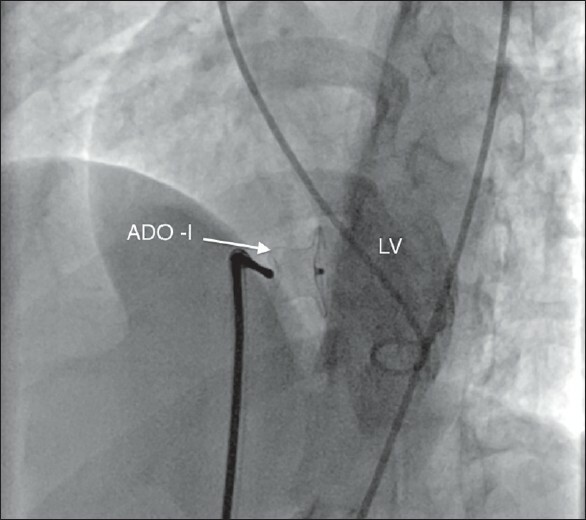 One of the reasons for device embolization is improper alignment of the retention skirts of the device in the plane of interventricular septum. Initial device alignment was not too perfect in the plane of interventricular septum on left ventriculogram in this patient after positioning the muscular VSD occluder device. Since the right ventriculogram showed a reasonable alignment, the device was released and later embolized. Large anterior muscular VSD may have better device alignment from jugular route than femoral venous route. In apico-infundibular VSDs  which have a very oblique course from left to right ventricle, different designs of the device such as post myocardial infarction muscular ventricular septal rupture occluder which has a larger 10 mm waist thickness might be useful. 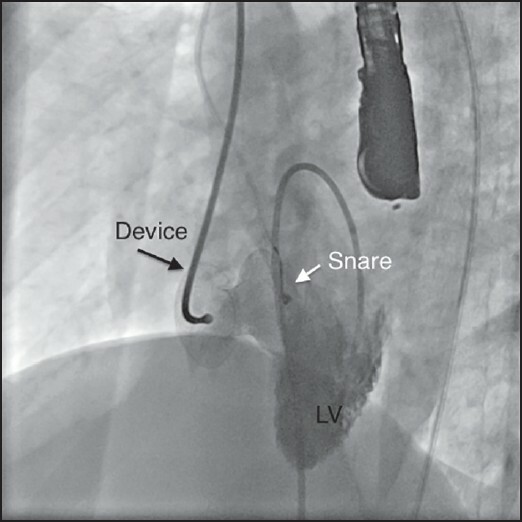 When device failed to hold to the precise location of defect across the interventricular septum, stabilization of the LV side of the device by snaring the LV end of the disc with a small snare from femoral arterial end was adopted in this patient. This innovative biventricular stabilization of the device before release helped in push-pull of the device across the defect to get an exact centering of the device. Biventricular stabilization of devices to position double disc devices across the VSD using a small snare from the femoral arterial end. This case report illustrates various valuable lessons learnt during this procedure. Gupta M, Juneja R, Saxena A. Simultaneous device closure of muscular ventricular septal defect and pulmonary valve balloon dilatation. Catheter Cardiovasc Interv 2003;58:545-7. Butera G, Carminati M, De Luca F, Chessa M, Bini Margherita R. Transcatheter treatment of muscular ventricular septal defect and pulmonary valvar stenosis in an infant. Catheter Cardiovasc Interv 2002;55:212-6.
van Roekens CN, Zuckerberg AL. Emergency management of hypercyanotic crises in tetralogy of Fallot. Ann Emerg Med 1995;25:256-8. Kothari SS. Mechanism of cyanotic spells in tetralogy of Fallot - The missing link? Int J Cardiol 1992;37:1-5. Kumar K, Lock JE, Geva T, Ventricular septal defects between infundibular and left ventricular apices: Imaging and interventional considerations. Circulation 1997;95:1207-1213.